Comprehensive ophthalmological examinations in children can be quite different from exams that you may have experience previously. Please read the following information to prepare for your upcoming appointment. We understand that many children are scared about visiting any doctor or are afraid that they will receive a shot. You can assure your child that we will not use any needles to administer any shots. Your child may already know that we will be giving eye drops. You can prepare your child by explaining that the drops do not hurt, but that they feel like a drop of water going into the eye. If your child is seeing us for the first time, please be prepared for your visit to last, on average, one-and-a-half to two hours. A parent or legal guardian must accompany all children age 17 and younger. During the visit, eye drops will be given, and the verbal consent of a responsible adult is required. If a grandparent or other adult will accompany the child, then a parent or legal guardian's written permission is required in order for us to give the eye drops and perform a complete exam. After checking in at our reception desk, you will be given a health history form to fill out for your child, and will then be called back to the examination area by a member of our staff. To help save time, you can fill out some of these forms in advance, click here for New Patient Forms. The initial examination will include a discussion of the reason for your child's visit. If you have noticed any particular problem, we will ask you about its severity in detail. Your child's vision will be tested using one or more of several methods. For children who are verbal, this may include pictures, letter matching, or the full alphabet.  As age and development allow, we will test your child's depth perception and color vision. All children will be checked for imbalance of the eye muscles. If any imbalance is noted or there is anything about the examination up to this point that is not completely normal, the doctor will see your child prior to dilation. Next, your child's eyes will be dilated. This will be done with either a drop or a spray. Sometimes two applications are needed to fully dilate the pupils, especially if your child's eyes are very dark. The dilating drops that we use in children last longer that the drops we use in adults, on average 6 to 8 hours. We must use these drops because the muscle which we need to relax is "stronger" (it has more tone) in children than in adults. Whereas adults are able to tell us with great accuracy which prescription lens is best, children cannot. We need full relaxation of your child's focussing system to accurately assess whether your child requires glasses or not. The vast majority of children are able to see clearly by the next morning; even if the pupils still appear a little dilated, the blurring effect of the drops has usually worn off. The drops require a full 30 minutes to take effect. After this time, the doctor will check your child's refraction (glasses prescription) and examine your child's eyes, including the retina and optic nerve. At the conclusion of the examination, our doctors will discuss their findings with you, offer their recommendations for treatment, and suggest appropriate timing for your child's next examination. Please ask any questions you have. Feel free to bring a written list of questions if you like. The examination is not complete until all of your questions are answered. At the conclusion of the examination, you may be given written instructions or additional handouts for your reference.